When heading out to the dog park on a sunny afternoon you really see dogs of all shapes and sizes. From tiny Chihuahuas all the way to Great Danes, the dog world is filled with breeds with many different features. Dachshunds have short legs and long bodies, Sighthounds sport deep chests and some bully breeds are stocky with thicker upper bodies. When browsing Instagram, (and the internet beyond) I find myself seeing all of these breeds being shoved into the standard dog backpacks that have become so popular. Many of these easily marketable, brand name bags have huge saddlebags that look disproportionate on most pooches. Often times they seem so overloaded that the poor dog has difficulty walking or you see them tripping over the nylon straps that dangle down their bellies. I regularly see people reaching out for solutions for chafing and joint problems. I cringe when I see photos like this because the simple fact is, not every breed will fit into the traditional “standard” sizing of most backpacks. Some require a custom option to allow freedom of movement, and freedom of chafing and irritation caused by ill fitting packs. Recently I was offered a chance to test an alternative custom option out on the trail – a Groundbird Gear Trekking Roll-Top Pack with Tailor-made Harness to test out in our local River Valley and in Alberta’s Rocky Mountains for a period of 2 months. I’m not going to lie, I already own 6 other dog backpacks for Atlas. He sports one of almost every style imaginable and although I’m no “expert” I think I can definitely spot a well designed pack from a crappy mass produced version. All packs have pros and cons (many with significant “fit” cons) but I have to say, this Groundbird Gear backpack and harness is the absolute nicest, most well thought out, high quality piece of dog equipment I have ever had the pleasure to test. When talking about this particular piece of gear, I must first explain that when you purchase one of Groundbird Gear’s backpacks, you also get a custom made nicely padded harness with it. The harness can be worn with or without the saddle bags attached, so really you are getting two products in one. 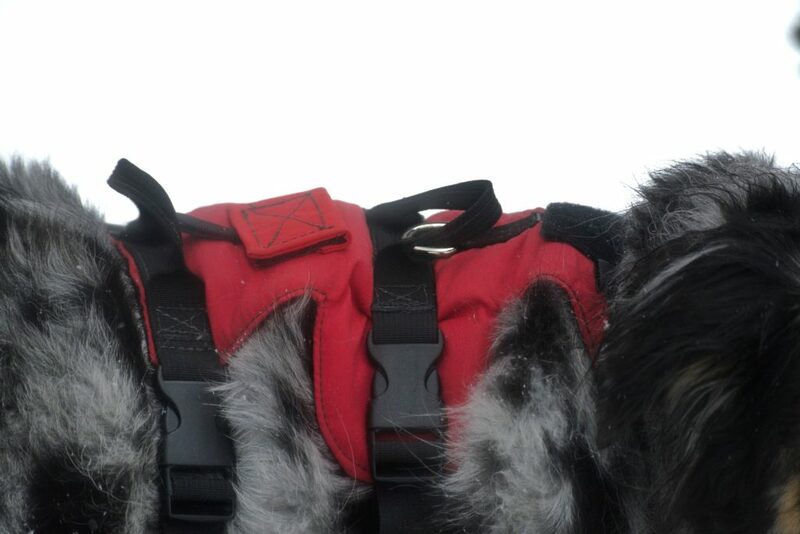 You can also purchase just the custom fit harness separately and add on the saddle bags at a later time. In the remainder of this review when I say “pack” or “backpack” I am referring to both the harness and saddle bags together. Groundbird Gear aims to provide Dog harnesses and saddlebags that not only fit better but last longer than any others on the market. Groundbird Gear packs are all sewn by hand in the USA by a seasoned ‘Thru-Hiker’ named Marie who has earned herself the trail name “Bobwhite” on her adventures on the Appalachian Trail. 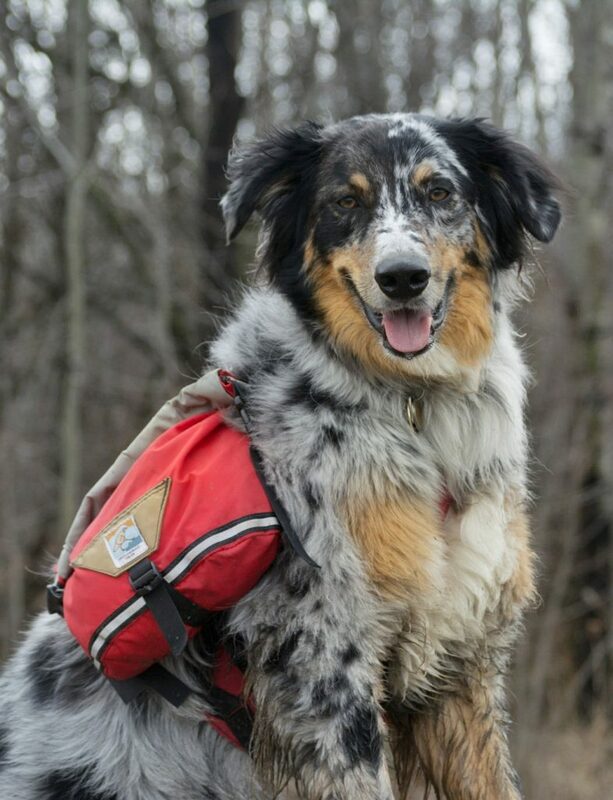 As an avid backpacker Bobwhite knows the importance of having light and functional dog gear while out on the trail. This saddlebag and harness combo weighs in at a mere 16oz saving precious weight while on your journey. This pack may be light but it sure has a large capacity. The medium sized saddle bags can hold a whopping 16 cups of kibble. The best feature of the roll top saddle bags (which I have never seen on any other dog backpack before) is that you can roll the bag down for times when you don’t need to pack it as full and you can unroll it for times when you need to have extra or larger gear inside. The harness includes 2 extremely sturdy handles, one near the front and one near the back. This feature allows for extra control on the trail and is vital for slippery or dangerous terrain. This pack also features an optional bungee cord that is zig-zagged through the top for attaching light gear. Alberta is known for crazy spring weather. One day it will be bright and sunny with no snow on the ground and the next, there will be a major blizzard. In addition to weather concerns, Atlas is a known gear abuser. He can often be spotted on the trail scraping his backpacks between tangled trees and smushing them up on the rough bark of spruce trees. He plays rough with his fellow dog friends and rolls himself into the mushiest mud he can find for the shear thrill of it. He loves going swimming and often dives into ponds and rivers when we are out on the trail. 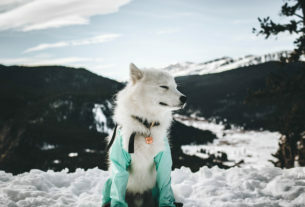 Dogs are not kind to their gear like people are which makes durability an extremely important factor when choosing a dog backpack. 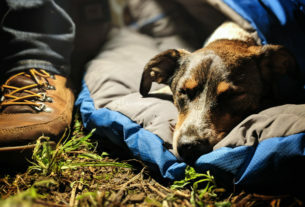 This extreme weather and canine abuse on the trail has been significant during our testing period and this Groundbird Gear pack has held on strong without so much as a scratch or damaged seam. Each Groundbird Gear pack is created by hand with extremely durable polyurethane coated and DWR treated 400 denier packcloth. The packs feature durable (made in USA) plastic buckles along with heavy duty Velcro and webbing. All components are sewn together with tough, adventure tested polyester thread. The packcloth that is used is waterproof, breathable and quick drying. Although the bag is not 100% waterproof it is extremely water resistant. The materials used throughout the bag seem to repel mud and are easily wiped off with a damp towel. During our testing Atlas ran through a bunch of wet and sticky mud (and yes he rolled in it) and the bag was basically perfectly clean after a quick wipe down with the towel I keep in the car. The saddle bags do not have a bunch of unnecessary features like internal pockets or zippers which saves on weight. 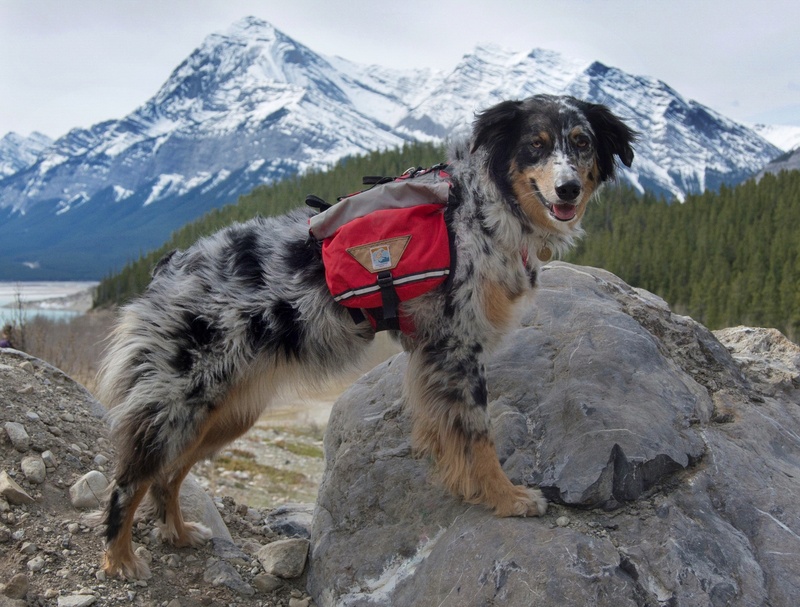 The seams of this backpack and harness are carefully added all by hand and there are many areas with extra reinforcement to ensure that they are strong enough to keep up with even the most adventurous of dogs. 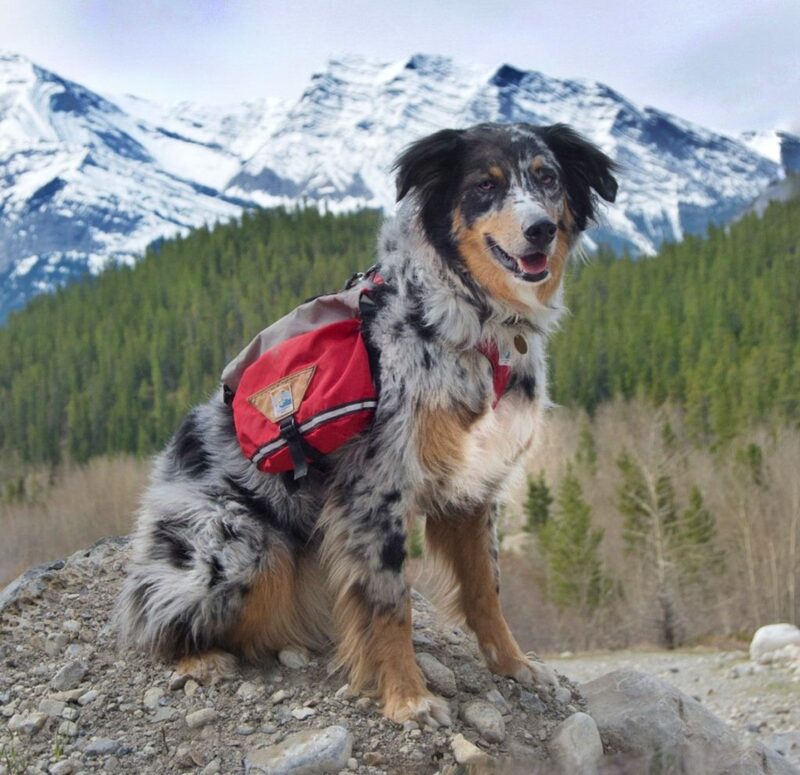 As previously mentioned, the best part of this backpack system is that when you purchase the roll top pack you receive a custom fit harness that is perfectly tailored to fit your specific canine companion. Gone are the days where you should have to carefully study a confusing size chart only to end up wondering if the size you chose will fit your pooch. With Groundbird Gear, all you need to do is measure your dog (carefully) and enter your measurements onto an online form. Groundbird Gear takes these measurements and creates a harness that will fit your dog like a glove. I was really nervous when measuring Atlas and made sure to measure him several times with the help of my husband. (It’s not easy to get an Aussie to hold still for very long) I was scared that if he lost any weight or gained any that the pack would not end up fitting. My worries were put to rest when I tried the harness on him for the first time because it actually allows for a bit of adjustment. 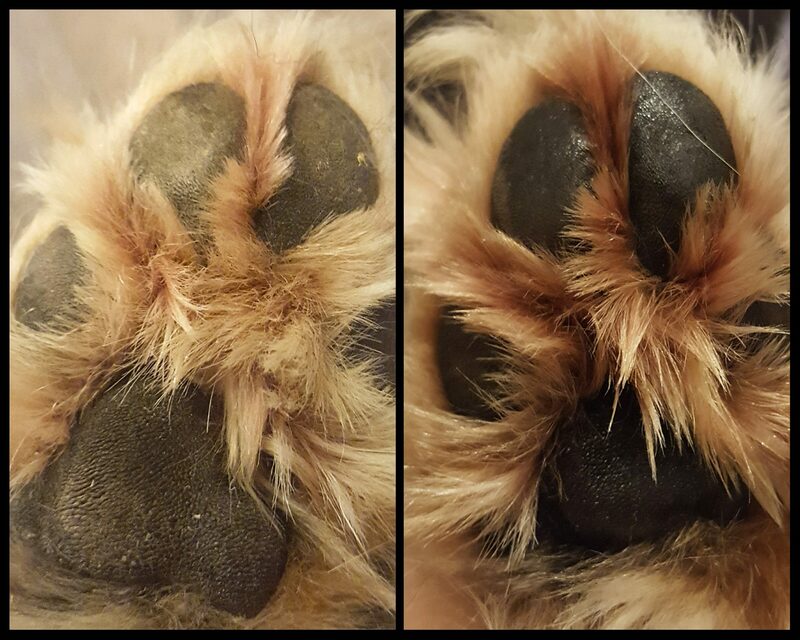 This is perfect for times when his coat is fuller during colder seasons. This small amount of adjustment vs having a lot of room of adjustment (like some other brands) means that you will not have the strap “tails” hanging down that would otherwise cause your dog discomfort. Groundbird gear clearly knows how to size their harnesses flawlessly because Atlas’s Harness fits absolutely perfectly. The straps are designed to be set further back as to not chafe the front legs and Atlas seems to have much more freedom of movement with this backpack than any other one we own. 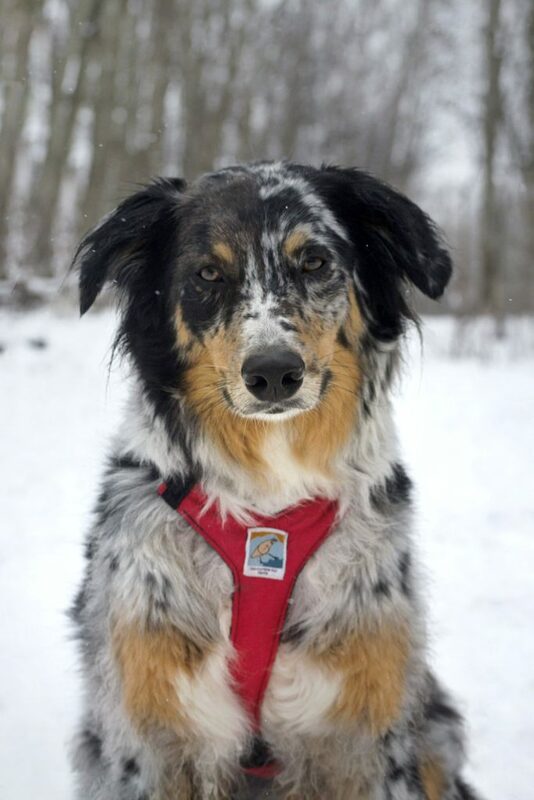 The custom harness features 4 heavy duty plastic buckles that keep it from shifting around when your dog is moving. The saddle bags attach to the harness with one piece of ultra strong Velcro, one durable buckle that wraps underneath the stomach and 2 smaller buckles towards the back for extra security. Atlas loves to roll on the ground and has never even been close to dislodging the saddle bags. The saddle bags also have cinch-able webbing to secure the load closer to the body which eliminates any floppy bag issues. This feature is key to a comfortable and secure load and is missing from many major competitors. Groundbird gear also has one other very unique feature. COLOUR OPTIONS! Groundbird gear allows you to select your own custom colour options or you can select one of their pre designed colour choices such as the feminine “Trail Princess” or the ultra high viz “Safety Dance” options. With the selections that were available I was able to design a pack that closely matched my own human ‘dog park backpack.’ (Talk about twinning!) These packs also feature a tasteful logo “patch” and a nice ultra reflective stripe across the bottom. Groundbird gear also sells their saddle bags separately if you already have the harness and are a fan of having multiple colour options for the trail. I can definitely see myself getting a spare bag just for a bonus pop of colour. This pack seems to have an endless supply of amazing features and it is absolutely the best dog backpack system I have ever tried. I love that it is built custom to fit the measurements of my dog perfectly. The bag is more expensive than some other brands, but the fact that it is handmade with such quality materials gives me confidence that this pack will outlast all of my other ones. The care and skill that Bobwhite has while creating these packs is unmatched by any mass produced flashy name brand packs. These things are light, easy to clean, durable, feature packed and built to last on any hike. Groundbird Gear understands the need for light weight, high quality gear and even offers a warranty on their products. This pack continues to outshine all of my other dog backpacks and it is the one I recommend first when someone comes to me asking for advice. I love this pack more and more each time I use it. The only downside I can think of is that currently these packs are only available to those who live in Canada and the United States. If you are looking for more information on these fabulous packs I encourage you to visit their website. 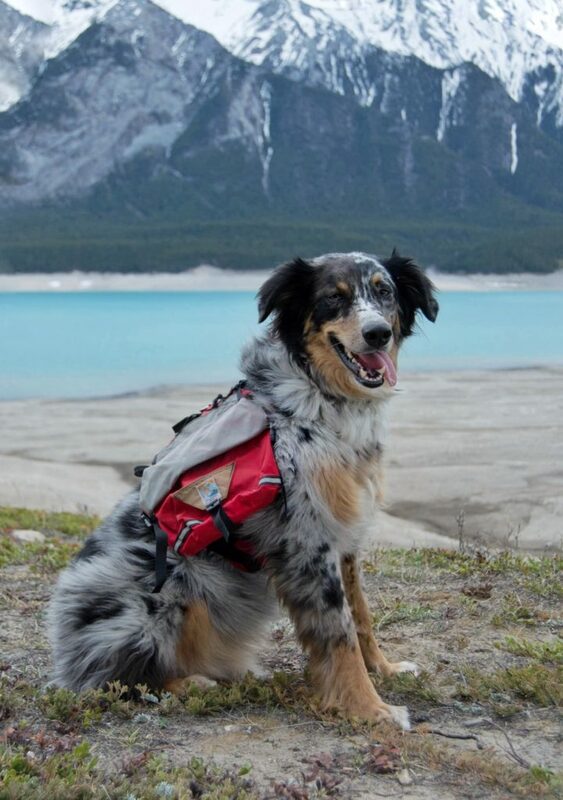 It is chalk full of helpful information on how to pick the best backpack to fit your individual dog and features lots of interesting information on thru hikes and gear. There is currently a waiting list for a pack and Bobwhite has mentioned that there are some changes coming in the future to the ordering process. This pack would work best for: all dogs of all shapes and sizes that are physically able to carry items on their backs. This pack functions perfectly in all climates and is suitable for all scales of hikes. This pack would not work best for: People who live outside of Canada or the United states or dogs that are physically unable to carry a load on their back. People who cannot afford the higher price point. Anyone who does not have time to wait to have their custom pack created and shipped to them.